“The Prince George Cougars’ $5,950 donation to the BC Liberals was the biggest in the party’s unaudited report for Feb. 17-22,” writes Bob Mackin of theBreaker.news. “The Cougars donated almost exactly a year after Prince George-Valemount Liberal MLA (and notable Cougars’ fan) Shirley Bond signed a cabinet order excusing B.C.’s six Western Hockey League team owners from paying the scholarship-eligible players $10.85-an-hour.” . . . Mackin has more, including a look at how the WHL worked to get that exclusion, and it’s all right here. The Brandon Wheat Kings, celebrating their 50th anniversary season, added five more players to their Dream Team on Sunday. . . . They announced that the third line comprises Marty Murray (1991-95), Eric Fehr (2000-05) and Ray Ferraro (1983-84), while the first defence pairing revealed features Keith Aulie (2005-09) and Kevin Cheveldayoff (1986-90). . . . Earlier, the Wheat Kings announced a fourth line of Matt Calvert, Mark Stone and Jordin Tootoo. . . . When completed, the team will comprise two goaltenders, six defencemen and 12 forwards. The BCHL’s West Kelowna Warriors, the defending national junior A champions, aren’t going anywhere. They announced Friday night that ownership has been restructured, something that means they won’t be moving to North Delta, B.C. . . . The Warriors, playing at home, lost the opening two games of their first-round playoff series to the Merritt Centennials, 6-5 on Friday night and 5-4 in triple OT on Saturday night. The series resumes Monday in Merritt. 4-3 victor over the Oil Kings. . . . F Davis Murray (3) gave the home team a 1-0 lead at 1:47 of the first period. . . . The Broncos tied it at 10:17 on F Glenn Gawdin’s 24th goal. . . . F Trey Fix-Wolansky put Edmonton in front with his 22nd goal, at 12:11. . . . 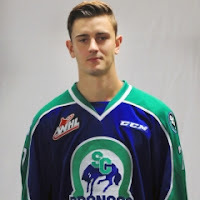 The visitors pulled even again as F Kaden Elder (14) scored at 6:37 of the second period. . . . F Conner Chaulk’s seventh goal gave the Broncos their first lead, at 11:28. . . . F Aleksi Heponiemi scored No 26, on a PP, at 4:20 of the third period to give Swift Current a 4-2 lead. . . . The Oil Kings cut that to one when F Graham Millar (11) scored at 12:15. . . . Gawdin also had an assist, as did Fix-Wolansky. . . . G Jordan Papirny turned aside 34 shots to earn the victory over Josh Dechaine, who made 25 saves. . . . Swift Current was 1-3 on the PP; Edmonton was 0-2. . . . The Broncos (34-20-10) have won four in a row. They will finish third in the East Division. . . . The Oil Kings (20-40-5) have lost eight straight (0-7-1). Edmonton, in its 10th WHL season, has lost 40 games for the second time. The other was in 2009-10) when it dropped 43. . . . Announced attendance: 11,041.
hours, had lost their previous four games (0-3-1). . . . After losing 6-3 to the visiting Calgary Hitmen on Saturday night, Pats GM/head coach John Paddock told Greg Harder of the Regina Leader-Post: “If I wasn’t concerned I probably wouldn’t be doing my job. I’m not making any excuses. It’s just fact. We badly need rest. Every team has gone through it — a heavy schedule. We hit ours at the end of the year.” . . . The Pats are off now until Wednesday when they visit Swift Current. . . . On Sunday, F Adam Brooks got the Pats started with his 36th goal, shorthanded, at 15:12 of the first period. . . . That was Regina’s WHL-leading 20th shorthanded goal this season. . . . Brandon tied it when F Stelio Mattheos got No. 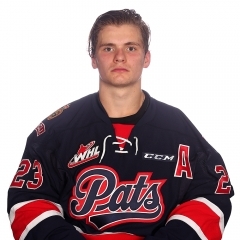 25, on a PP, at 1:07 of the second period. . . . D Connor Hobbs (28) put the Pats back out front, on a PP, at 15:06. . . . The Wheat Kings tied it again, this time on F Tyler Coulter’s 30th goal, at 16:29. . . . Steel, who leads the WHL with 119 points, including 46 goals, broke the tie and F Wyatt Sloboshan (9) added insurance with an empty-netter at 18:55. . . . Brooks, Hobbs and Steel each had an assist, as did Mattheos. . . . G Tyler Brown earned the victory with 36 saves. . . . Brandon got 53 saves from G Logan Thompson, who wasn’t beaten by F Austin Wagner on a third-period penalty shot. . . . Each team was 1-5 on the PP. . . . The Pats (45-12-8) lead the overall standings by five points over Medicine Hat. . . . Brandon (29-17-10) is likely to finish in the Eastern Conference’s first wild-card spot. . . . Announced attendance: 3,851. . . . Greg Harder of the Regina Leader-Post reports that Pats F Duncan Pierce will miss up to six weeks with a hairline fracture in his right fibula. He was injured on Saturday night. . . . On Sunday, the Pats lost F Dawson Leedahl in the second period after he absorbed a check from Brandon D Dmitry Osipov. was outscored 23-2 in those games, having also lost 8-0 in Prince Albert and 4-0 in Saskatoon. . . . Moose Jaw led 3-1 and 7-1 at the period breaks. . . . The Warriors stretched that 3-1 lead to 5-1 with two goals in 44 seconds early in the second period. . . . Halbgewachs has 46 goals, two off the WHL lead that is held by F Tyler Wong of Lethbridge. . . . F Thomas Foster helped Moose Jaw his 21st goal and two assists. . . . F Noah Gregor scored twice for the Warriors, giving him 24, with singles from F Brayden Burke (18), F Branden Klatt (7), F Luka Burzan (14), D Dmitri Zaitsev (1), F Tanner Jeannot (19), F Justin Almeida (10) and F Brecon Wood (1). . . . Zaitsev, a Russian freshman, scored his first WHL goal in his 64th game. He also has 17 assists. . . . Wood, a 16-year-old freshman from Edmonton, has a goal and one assist in 55 games. . . . D Colin Paradis, D Josh Thrower and F Brett Howden each had three assists. Almeida and Burke had one each. . . . 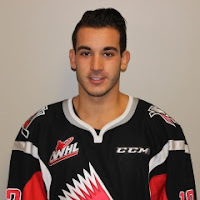 The Ice got goals from F Noah Philp (8) and F Barrett Sheen (8). . . . Moose Jaw G Brody Willms stopped 33 shots. . . . Kootenay starter Jakob Walter allowed five goals on 16 shots in 22:57. Payton Lee finished up, stopping 23 of 29 shots in 37:03. . . . The Ice was 1-2 on the PP; the Warriors were 0-1. . . . Moose Jaw (41-17-8) has won nine in a row. . . . Kootenay (14-41-19) has lost three straight. . . . Announced attendance: 3,476.